Play 95 four bar vocal phrases, sung by LollieVox, in real time on your keyboard or from the Piano roll, in whatever pitch, chords or tempo you like. 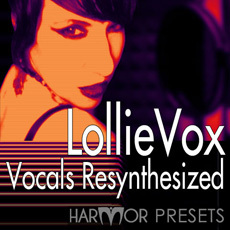 Drag and drop any of the 95 pitch flattened source vocal samples on to 25 special Harmor presets. These include other playable effects, such as robotic vocoding, sustained pad sounds or mutated formants, giving 2375 possible combinations. Laurie Webb aka LollieVox wrote for artist LeAnne Rimes while at Curb Music Publishing (1997-2002). Then in a twist of fate in 2005 she became famous all over the world for her song ‘Aren’t You Clever’ mixed by Mr. Special (Joseph Fasion) which was featured as the opening demo song of FL Studio 5, then again for her song ‘Dance With me’ in FL Studio 7, remixed by EDM artist Blake Reary. Lollievox also was featured on Beatport for a song called ‘Conscious Mind’ remixed by Noel Sanger & DJ Leko & has recently released exciting new pop/rock album Optimum Momentum recorded at Wilderside Productions & The Castle Studio in Nashville TN . She has also relased several new music videos including her hot collaboration with The Soundwave Tramps , Zone Into The Music as well as an album on itunes featuring mixes by Amerigo Gazaway, This Is Art & more.